Click here to watch 'New Lines', a film by Ryan Scott shot on the Little White. Click here to watch 'A Little White Christmas', a film by Ryan Scott shot on the Little White. 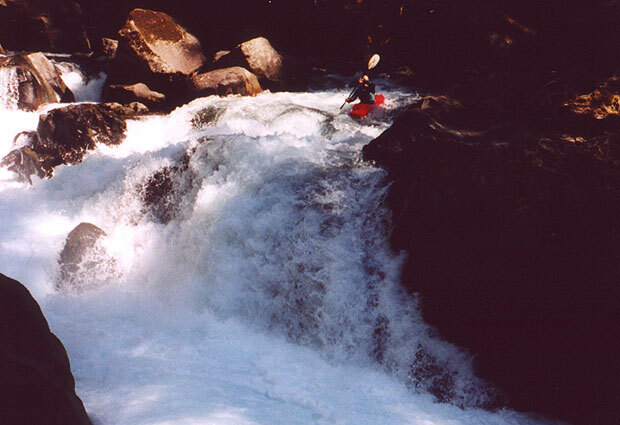 Copyright © 2000-07, Oregon Kayaking. 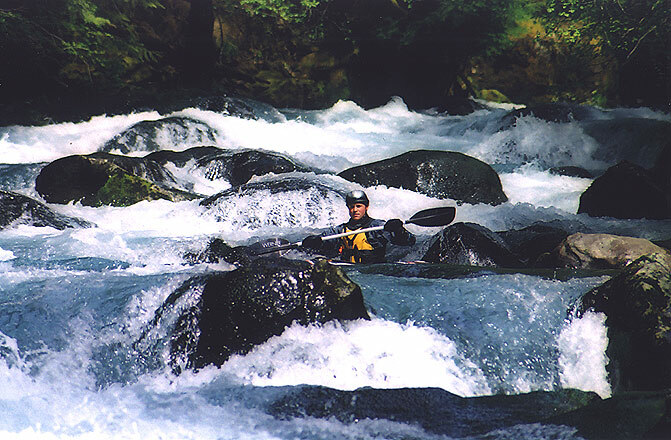 No part of this page may be reproduced, linked, or copied without the written permission of the Oregon Kayaking Webmaster. The Little White Salmon has achieved legendary status in steep creeking circles, and its reputation is well deserved. Few runs anywhere have as many high quality rapids and falls combined with such a long season. This creek almost always has enough water to run, which is very unusual for a creek that is so small and so steep. For those who have the skills, the Little White really shouldn't be missed. 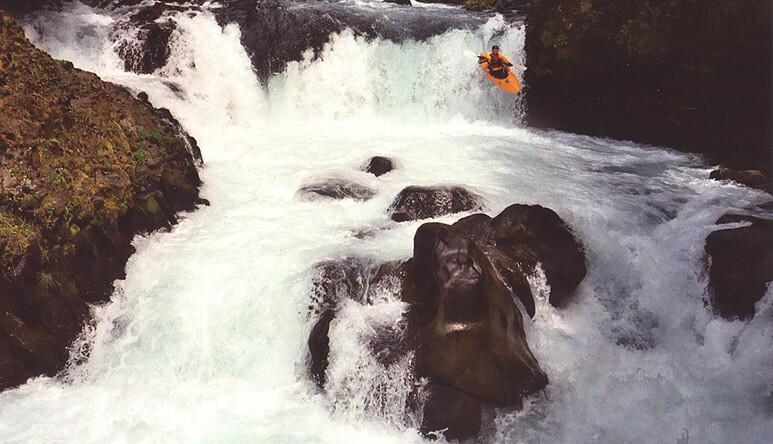 Accomplished Class Five paddlers like Germany's Jurgen Nickles (pictured here at the put-in) travel from around the world to paddle in the Northwest, and the Little White is usually one of their first stops. This report describes the famous (and most often run) lower three miles of this creek. The Little White is fed by an enormous aquifer that stores rain all winter and then slowly releases it late into the summer, making this a world class playground for class V paddlers when almost everything else is bone dry. The average gradient on this run is 238 fpm, and it's continuous nature provides an exciting ride for even the most well traveled boaters. That said, it would be easy to get dangerously out of control on this section so I feel obligated to say that tentative class V paddlers should NOT attempt this run. The Little White has some nice scenery and the stunning aquamarine water has to be seen to be believed. Below the put in you'll find some small class II-III drops in a very narrow creekbed with small eddies. Soon the creek tilts on edge and careens down through 'Gettin' Busy', a half mile long rapid that will keep even the best boaters entertained. This long!! boulder garden requires full-on, non-stop reactionary boating and can either be great fun or a terror-fest depending on your ability level and flow. At lower flows (below 3 feet) there are plenty of small eddies and at high flows (3.5 feet and above) it becomes a non-stop gauntlet of burly holes and powerful hydraulics that are guaranteed to put your skill and nerve to the test. Jesse Coombs catches an eddy in Gettin' Busy. Below Boulder Sluice there is one more big, bouldery drop known as 'Island'. 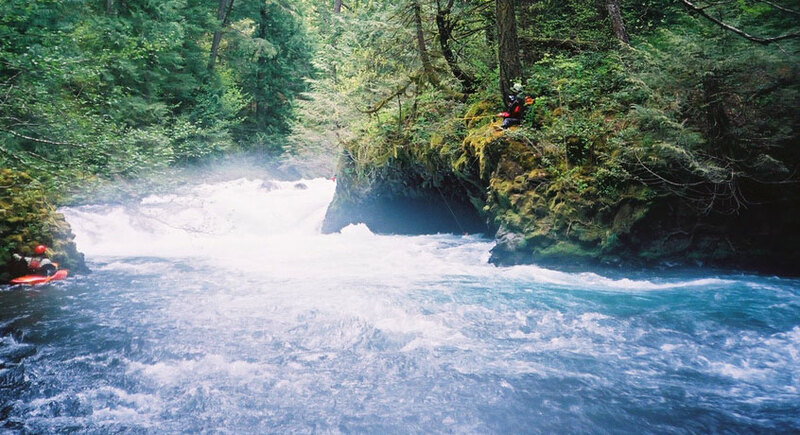 Portage or scout on the right, but stay on your toes as it is easy to get blown into this one! Island is usually run down the middle or middle-right at lower flows, stay away from the far left side as it has pinning potential. Glenn Tatum (visiting from the Southeast) blasts through the crux move of Island Drop. Below Island rapid the boulders begin to disappear and the creek carves a magnificent channel down through the bedrock as you enter the waterfall-studded lower section. There are ledges and falls of every kind in this stretch, with hydraulics that range from benign to terminal. If you aren't familiar with the creek scouting is mandatory your first time down- there is no way to safely boat scout the lower part of this run! The creek never really gorges up but some of the bigger falls and ledges have steep, fast rapids leading right into them, so you could get into big trouble if you aren't careful. The first big drop in this section is Sacriledge. Here the creek accelerates over a series of ledgy slides that culminate abruptly with a folding ten foot ledge with a wickedly powerful hydraulic and a large cave under the river-left wall. (This is known as 'Dave's Cave'). Paddlers end up in the cave every year, and it usually takes an hour or so to retrieve boats and gear from under the wall when they do. I remember one exciting trip when I didn't quite clear the hole at Sacriledge and I started cartwheeling so fast I didn't know what end was up. I had been leading up to that point, and as Josh came down he said he saw my stern go up as he boofed over me; he could have 'high-fived' my boat as he went by! Luckily I flushed a few seconds later (fortunately not into the cave) and rolled up. Below Sacriledge is Double Drop (scout right, watch out for the hole at the bottom) and then a long, sweet boulder slalom leading to the lip of S-Turn Falls, a 13 foot falls followed by a narrow drop immediately downstream. Below S-Turn are a few more ledges and boulder gardens, then you reach the Bowey Hotel. This drop is very deceptive (especially for first-timers) because it has a long lead-in (about 50 yards) culminating in an abrupt left hand turn where the creek drops over a five-foot ledge with a very powerful hole. Swims here are very dangerous because Wishbone Falls is 100 feet downstream with no significant eddies in between. The hole gets more powerful the further left you go, so boofing right is recommended! 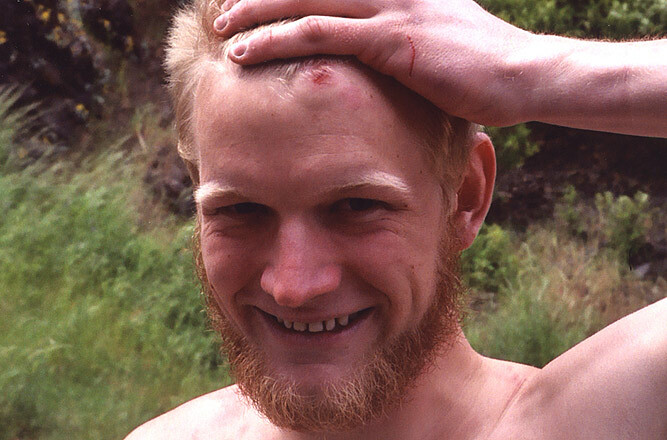 In the Spring of 2003 a paddler swam in the hole at the Bowey Hotel at 3.1 feet and was swept over Wishbone Falls; he had no pulse when he was recovered from the pool below, and was resuscitated and airlifted out. Take this drop very seriously! Note the large surge of water coming from the hole against the river-left wall. This hydraulic is extremely powerful! Immediately downstream from the Bowey Hotel is Wishbone Falls. Here a steep ledgy rapid plunges directly into and over a twisty twenty foot waterfall on the left and an unrunnable cascade on the right. You pretty much have to run Wishbone because it drops into a steep vertical walled gorge with almost no way in or out. There are ways to portage, though. I ran the falls twice my first time down because John was willing to haul my boat up from the rim of the gorge and belay me as I scrambled up a tree to the top. The tree I climbed has foot pegs driven into it (by fishermen in years past) which makes portaging easier. Ever since I broke my back running Spirit I now do a throw-and-go at Wishbone, which is almost as fun as running the falls used to be! Immediately below Wishbone paddlers encounter what I consider to be the psychological crux of the Little White. 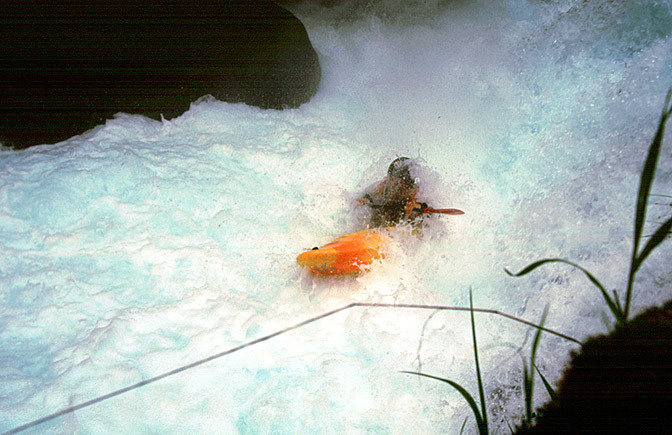 There are lots of harder rapids on this run, but few have such deadly consequences. 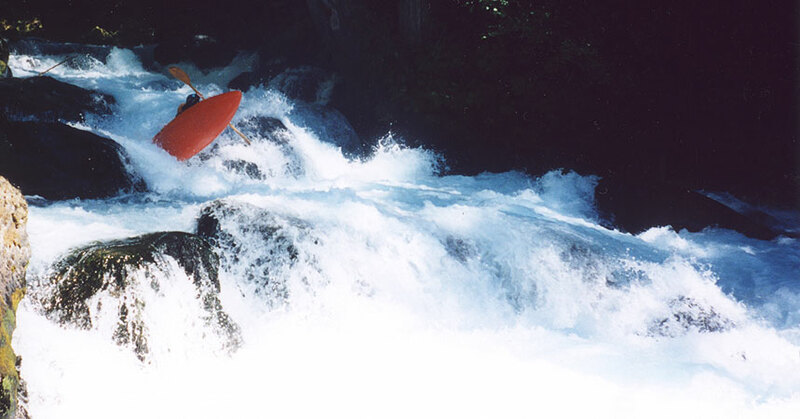 Here some pushy drops in a small gorge culminate with Stovepipe, a super-nasty rapid that is almost always portaged. A swim over Stovepipe could be lethal, so be extremely careful here. The gorge above Stovepipe has two distinct drops. The first is a pretty straightforward boulder garden some locals call 'The Squeezes'. (pictured below). The second drop (known as Horseshoe) is probably one of the most under-rated drops on The Little White. This U-Shaped ledge has a large, submerged boulder backing up the flow about eight feet downstream of the middle of the 'U', making the middle of this ledge-hole a nearly perfect drowning machine that is very difficult to escape from if you don't make the move. The tricky cross-currents just above Horseshoe are greatly amplified by the walls and tend to funnel unwary paddlers into the middle of this drop resulting in prolonged, highly dangerous swims. I personally watched a friend get recirculated many times (out of his boat) in the middle of Horseshoe one time at 3.1 feet before he was able to pull himself (underwater!) along the back of the ledge and escape the hole on the river-right side. It was agonizing watching him get pounded but I was the only thing between him and Stovepipe so I had to stay in my boat and watch. Not pleasant. This was not the first near-drowning at Horseshoe, and it won't be the last. Swims here are always life-threatening because the V+ drop known as Stovepipe waits 40 feet downstream. Immediately below Horseshoe eddy out on river-right and portage Stovepipe on the right bank by scrambling across the huge log that is balanced on the rock in the middle of the river. Basically, the entire flow drops into a pothole, with a large submerged rock extending out into the pourover from the river-right side. The submerged rock is hidden at flows 3 feet and up, making this rapid deceptively dangerous for those not familiar with the river. Below the pothole, the flow flushes into a kind of 'room' on the left with severely undercut walls. Do yourself a favor and portage this drop! I seen a few people run the main left-side line at Stovepipe, with a variety of results. I saw a professional kayaker clean it one day, but on another day I watched a local paddler have a gruesome line resulting in a smashed-up boat and minor injuries; He was very lucky to have gotten off so easily. Jon and Eric portage Stovepipe. Horseshoe is visible just upstream, and 'The Squeezes' at the entrance to the gorge above that. About two-tenths of a mile of fun class three drops lead to Spirit Falls. Spirit is an incredibly clean 33 foot plunge falls that is one of the most photographed and videoed waterfalls in the world. I love this waterfall, but I have seen folks break paddles, lose paddles, and one guy get annihilated after getting pushed against the right wall, so be careful! I broke my back pretty badly running Spirit on February 28, 2001. I am now back paddling full steam, but my big waterfall days are over. 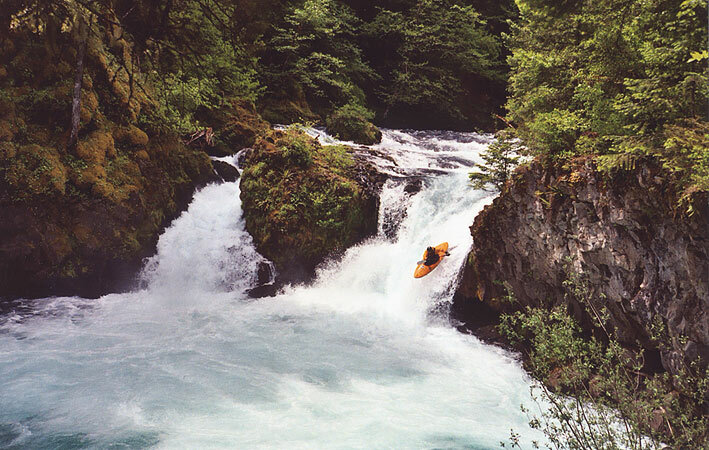 Practice makes perfect: Josh Knapp styles Spirit Falls. 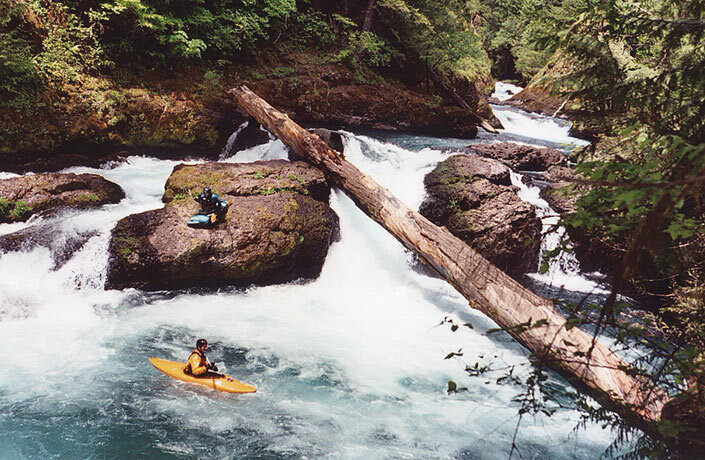 Boaters who run Spirit Falls need to be aware of the hazards associated with this drop. Five paddlers have broken their backs running Spirit, and once you drop in you are on your own as the falls plunges into a huge punchbowl. The creek exits the punchbowl a hundred feet downstream into Chaos, a six foot river wide ledge that is a no brainer if you run it middle or left. Chaos is very dangerous for swimmers because most of the current pours into a pocket against the right wall as it exits the punchbowl below Spirit. There have been several near-drownings in Chaos (one paddler was pulled out with no pulse and had to be resuscitated!) so if you swim at Spirit and lose your boat at regular flows, you have two rather unpleasant options: Swim the line through Chaos, (extremely dangerous) or do a tricky, technical traverse across the cliff face above the worst part of Chaos! Below Chaos there is a small rapid that has a couple of annoying logs blocking the main flow- run far right. Below here is Master Blaster, the last major rapid on the creek. This drop is signaled by a cable car strung over the creek as is bends to the right. Scout and set safety on the river right, but be sure to eddy out high or you will be committed to running the drop! Master Blaster is a fast, bouldery lead-in to a big, beefy hole. You get about four good strokes above the bottom hole so make em' count! 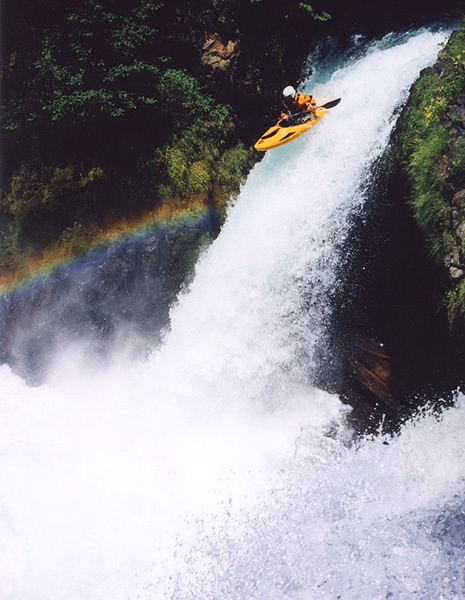 I know a guy who once ran every drop perfectly on the Little White (except Stovepipe, of course) and swam out of Master Blaster, so be sure and hit that hole with everything you've got, especially at higher flows. Immediately below Master Blaster is a short pool above an unportageable but runnable low head dam- run far right against the wall. There is a second, much larger dam just downstream that is also harmless (at regular flows; at high water it becomes quite dangerous) but drops about ten feet, providing one last bit of fun before the quarter mile flatwater paddle out on Drano Lake. 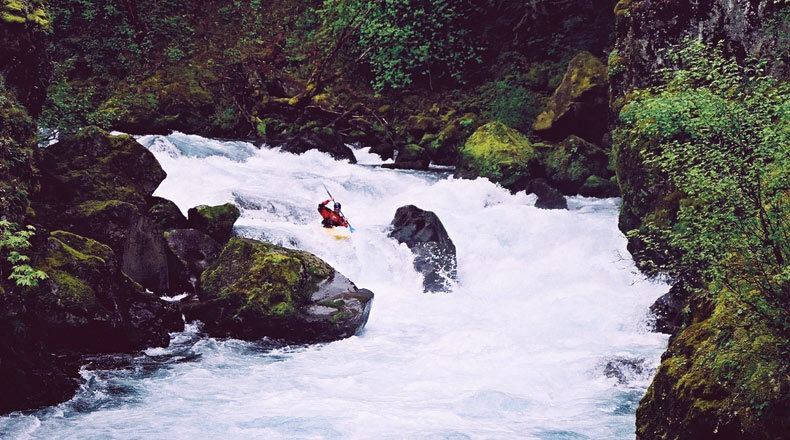 For more information about the Little White, pick up the 2nd edition of Jeff Bennett's 'A guide to Washington Whitewater', a book no serious Northwest paddler should be without. GAUGE INFO: The Little White almost always has water, which is a minor miracle considering this run is so small and steep. This creek is fed by a large underground aquifer that tends to smooth out dramatic fluctuations in flow. In other words, the LWS takes awhile to get going, but once it is running it drops very slowly, like around an inch a week in the spring and summer during snowmelt (it is often very stable in the winter as well, once it gets going). The creek has a very long season, running from November through late July in most years, or year-round if you don't mind low water. There is no online gauge for the Little White, but someone on the PDX Listserve usually knows the flow, or John at the Kayak Shed in Hood River. Also, you can check the internet gauge White Salmon at Husum, which often (roughly) approximates the flow in the Little White, especially in the spring and summer during runoff. A few inches makes a lot of difference on the Little White. In years past we used a stick gauge referred to in the Bennett Guide at the hatchery just upstream of the put-in, but this gauge was removed by hatchery personnel around 2001 (if memory serves). After the removal there was some uncertainty about flows on this run, especially for newcomers who had no way to 'guesstimate' flows at the put-in based on prior experience. Luckily for the paddling community, before the old gauge was removed local paddler Ron Reynier placed his own gauge downstream by the put-in bridge and carefully correlated flows. In the Summer of 2002 Ron placed a new stick gauge under the put-in bridge (on the river-left side). I have found that Ron's gauge corresponds pretty closely to the old gauge. 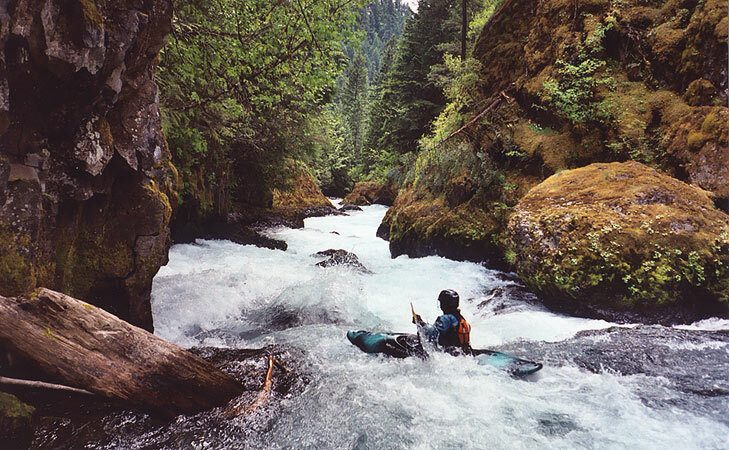 This eliminates any guesswork associated with flows on this run for future paddlers. Thanks Ron! NOTE: IN MY OPINION, THIS IS THE BEST CREEK IN THE WORLD, BUT IT IS ALSO A VERY SERIOUS RUN; TWO PADDLERS HAVE DROWNED AND BEEN RESUSCITATED ON THIS CREEK THAT I KNOW OF. THIS RUN IS CLASS FIVE, WITH EVERYTHING THAT RATING ENTAILS. THESE FLOWS ARE ACCORDING TO THE PERSPECTIVE OF THE AVERAGE CREEK-BOATER ( SUCH AS MYSELF ). I HAVE RUN THIS SECTION OVER FIFTY TIMES AT A VARIETY OF FLOWS, BUT THIS IS ONLY MY OPINION. BE CAREFUL AND HAVE FUN! 3.0 - 3.5 Medium-low ( 3.0 ) to medium-high ( 3.5 ) This is the most popular flow range on the LWS. It is often at this flow in the winter, and usually in May-July when we have a normal to above-average snowpack. Gets pushy at the high end of this range. 3.5 - 4.0 Medium-high ( 3.5 ) to high ( 4.0 ) Previous Little White runs at lower water highly recommended unless you are a professional kayaker or equivalent. 4.0 - 4.5 High to Very High Running the LWS significantly above 4.0 feet is V+, though it is being run higher and higher these days. 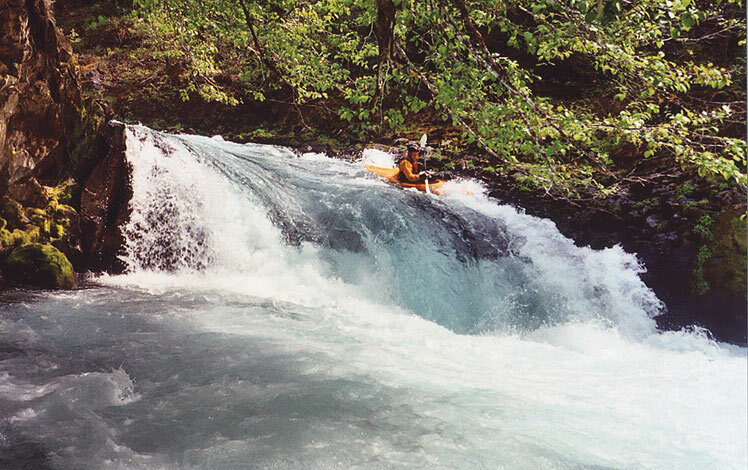 Many previous runs down the creek and/or an experienced guide is required at these flows unless you are a professional kayaker or equivalent. According to those who run the LWS this high, every inch over four feet adds a disproportionate amount of difficulty to the run. 4.5 - 5.2 Very High to Insanely High I really don't have any clue what happens to the Little White at these flows. It boggles the mind. The highest known run down the Little White was a solo run between 5.0 and 5.2 on the foot gauge by Hood River high water hero Erik Boomer. Erik did the run solo and portaged S-Turn and Spirit. Erik returned shortly after his record-high run and did the creek several times at 4.8 feet with local Pro paddlers Tao Berman and Todd Anderson before it dropped out. According to those who run the LWS this high, every inch over four feet adds a disproportionate amount of difficulty to the run. Jon Fowlkes rearranges some boulders with his head somewhere on the Little White..